All of my life, I have had a passion to learn about nutrition and am a voracious reader and skilled researcher. I am a true believer that what you put into your body and environmental factors play a huge role in wellness and that adding movement to your daily activities increases your metabolism, sharpens mental clarity, relieves stress and improves digestion. In order to expand my knowledge so that I can create a roadmap to health for my clients, I have formalized my training and earned these certifications. This program was a deep dive into of all of the major dietary theories, practical lifestyle management techniques, and innovative coaching methods with classes led by some of the world’s top health and wellness experts: Mark Hyman, MD, Arianna Huffington, Marion Nestle, PhD, MPH and Deepak Chopra, MD. 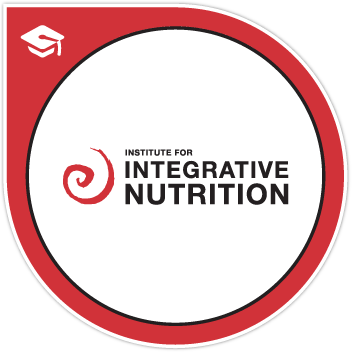 The training has equipped me with extensive knowledge in holistic nutrition, wellness coaching, and preventive health. Drawing on these skills and my knowledge of the different dietary theories, I work with clients to help them make lifestyle changes that produce real and lasting results. This course was developed by T. Colin Campbell, PhD, who wrote the ground breaking book The China Study. It is a science-based course that shows the connection between the role of diet and everyday health and healing. I learned to look critically at claims that are often written about in the media to determine if they are based on scientific evidence. I discovered even more about the role of nutrition in the development of chronic and degenerative diseases and I am able to apply this knowledge in my work as a wellness coach to help my clients better manage their health. The Plant-Based course, led by world-renowned plant-based chef educator Chad Sarno, is the most comprehensive plant-based cooking course ever put together. This course helped me build upon my solid nutrition knowledge base and I am able to apply what I learned in the kitchen to develop recipes, and prepare food for specific dietary restrictions, special diets and wellness-centered cuisine. The Vegan Desserts course, led by Fran Costigan, took me out of my comfort zone. I learned how to prepare delicious treats and pastries without the use of dairy, eggs and white sugar. This course is an in depth program about the science of weight loss, body composition and metabolic analysis. I have developed a weight loss program for my clients that is based on proven scientific methods. At Sunstone, I completed the 500 hour training program focusing on anatomy, physiology, yoga philosophy, yoga lifestyle, yoga ethics, technique and teaching methodology. I believe that yoga goes hand in hand with wellness. I offer private lessons in asana, meditation and breathing exercises. I received my training as a running coach through RRCA. Level II training includes a deep dive into the scientific, psychological, competitive and managerial aspects of working with individual clients and training groups. Courses taken include Applied Physiology for Coaches, Anatomy for Running Coaches, Injury Prevention and Recovery, Strength Training for Runners, Yoga for Runners, Coaching Running Form, Coaching Using the Galloway Method, Coaching for Trail Running, Coaching Youth Runners (K - 6th grade), Coaching Youth for Performance (7th - 12th grade), Coaching for Ultra Runners, Overview of Sports Nutrition Trends, Disordered Eating and Addictive Behaviors, Ethics & Risk Management Issues, and The United States Olympic Committee's SafeSport training. As a running coach, I work with beginning runners as well as seasoned runners. I develop plans for people at all levels, from couch to 5K all the way to marathon training. I like to focus on how to fuel the body appropriately before, during and after a run as well as good form so that my clients can reduce or eliminate injury and improve running efficiency. We can work to put together a plan that offers you the right amount of support to meet your goals and evaluate those goals throughout the plan. I understand both the physical and mental demands of running and provide a supportive environment so that my clients can reach their potential.